For months, now, City hall and the Chicago Police Department have been touting as a great success the dropping crime rate in the Windy City, but now that summer has finally arrived in the city by the lake, suddenly the gangbangers have come out of their burrows and the shooting galleries are open. The result is that over 80 people have been shot in the last week. The deadly wave of gun violence sweeping across the city has snared a 15-year-old boy, a young mother, and a four-year-old girl — the latter of who was shot while simply sitting on her porch — all three were fatally shot. Over the first week of May, dozens of people were shot even as officials were touting the improvement in crime. Six people were fatally shot as Chicago Police officials were expressing optimism in the last few months of stats showing that gun violence was on the downward trend compared to the more than 1,400 homicides in 2016 and 2017 combined. But before you point to Illinois’ over-zealous gun laws, the lower statistics coincided with an unusually cold “spring” in the area that saw temperatures stay in the 20s, 30s, and 40s. The weather was gray, chilly, and rainy keeping many gangbangers inside their cozy, warm hovels. However, just as May kicked in, temperatures suddenly jumped from the 40s to the 70s and 80s sending citizens into the streets en masse for the first time this year. So despite the strict gun laws, along with the people hitting the streets came the gangbangers with their guns. But I thought gangbangers and other criminals obey the gun laws….that’s what the liberals believe. Chicago recorded a 22.3% reduction in murders and a 26.5% decline in shooting incidents for the first four months of 2018 compared with the same period in 2017, according to police department data. 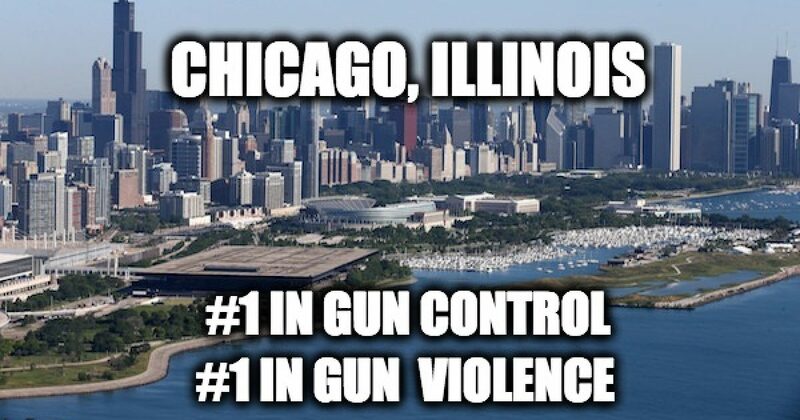 April also marked the 14th consecutive month in which Chicago recorded a decline in gun violence, according to police department spokesman Anthony Guglielmi. Almost 40 people were shot between Friday and early Sunday alone, according to the Chicago PD. Perhaps the shooters didn’t know it was against the law. Indeed, even police weren’t spared. Early on Friday morning, an ATF officer was shot in the face during a raid in one of the most dangerous parts of the city. The agent with the Bureau of Alcohol, Tobacco, Firearms and Explosives was wounded just blocks from where two Chicago police officers were shot by a high-powered rifle while riding in a covert van almost exactly a year ago. One officer was hit in the arm and hip, the other in the back. Last July, another Chicago police officer was shot in the leg while chasing robbers at 46th Street and Ashland Avenue, not far from the other attacks. The ATF agent was working with Chicago police around 3:15 a.m. Friday when someone fired from a gangway near 44th Street and Hermitage Avenue, not far from Davis Square Park, police said. The agent and other members of the strike force were acting on information that one of the gangs in Back of the Yards may have just received a number of guns, according to a law enforcement source. The officer was the fourth member of law enforcement to be wounded in the city’s Back Of The Yards neighborhood this year alone. Once the officer was shot, the CPD descended on the area like avenging angels. Perhaps unsurprisingly, this caused tension with residents who quickly realized that the sort of heavy response seen when an officer is shot is not quite the same level of intensity when a resident is shot. More than two dozen people outlined claims of intimidation, harassment and mistreatment by officers as they try to find the attacker. The group said while they feel for law enforcement, gunfire in the neighborhood happens on a daily basis and they don’t see a similar police response. “Just because you’re wearing a badge, it matters more? How do you think that makes us feel,” questioned protester Mayra Salinas. Naturally, police continue to claim they are trying to ” build relationships with residents” but incidents like this don’t seem to help much. In one of the weekend’s most frightening incidents, a drive-by shooting outside Mount Sinai Hospital targeted a group of people as they waited for word on a relative who was shot earlier in the day. Two women were wounded in the gunfire. I am sure he was infuriated that his talking points were destroyed, after all, Illinois has the toughest gun regulations in the country. This is the same superintendent who was only two weeks ago claiming that he and his department had succeeded in lowering crime rates in the Windy City. Indeed, here is a report in The Hill from April 2 proclaiming the city nearly crime free — it’s a report that was published just as the city was erupting in bloodshed. The city of Chicago has had 13 straight months of decreased gun violence, according to new statistics released by Chicago Police. Shootings dropped 17 percent in March when compared the same time last year, while murders decreased 25 percent. According to the department, murders dropped 22 percent year-to-date, while shootings decreased 25 percent in the first quarter of this year. “The progress we have seen in the first quarter of the year is a direct result of the hard work of our officers and the investments we have made to make CPD a better agency for everyone,” Eddie Johnson, the Chicago Police Department’s Superintendent, said in a statement. Of course, most of these 13 months were filled with cold, rainy, gray weather that kept Chicagoans indoors. Johnson went on to say, “our work is far from over.” The first warm weather certainly proved that line to be right! Unfortunately, it looks like the celebration is over the lower murder rates was a bit premature and those gun laws do not stop anyone from killing. Oh boy, liberal Illinois will give the criminals bad marks on their report cards and will continue to try to take guns away from the law-abiding gun owners.